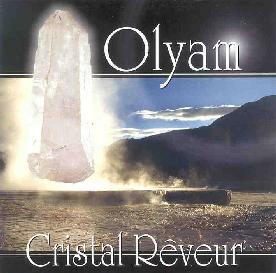 Olyam is a French musician who plays what is basically New Age music, though the presence of multiple instrumentation gives it a more genuine orchestral/classical sound. Olyam plays guitars, synthesizers and percussion, and guests contribute trumpet, cello, bass, flute, violin, panpipes, and some vocals. The promo sheet makes references to Vangelis and Mike Oldfield, which are fair analogies. However, Olyam's music, though very nice and good for an afternoon in the hammock, will come across as being way too "fluffy" for the average Aural Innovations reader. Still, a close listen does reveal Olyam to be an excellent composer, if not a particularly challenging one, and at several points I did hear bits that would appeal to the melodic prog rock crowd. But ultimately we're deep into Yanni territory here. For more information you can visit the Olyam web site at: http://www.olyam.com. Cristal Reveur is distributed by Musea Records. You can visit their web site at: http://www.musearecords.com.